Siga a un simpático guía fotógrafo profesional por Beacon Hill y aprenda cómo captar impresionantes fotografías en menos de dos horas. Disfrute de una narración histórica mientras navega por las pasarelas entre los principales monumentos y vaya a casa con increíbles imágenes que captan esta placentera aventura. We enjoyed this tour. Saba took us to see the houses and streets of this very beautiful expensive neighborhood that we wouldn't see on our own. We also appreciated the history and fun facts. We wished it could be longer, the time just flew. However, as far as the photography goes, maybe it's good for the beginners, but if you are intermediate or advanced, it is not a photography class, where you will learn something new. Saba was an amazing guide. The tour was on a freezing Saturday morning. Despite the bad weather, Saba didn't hesitate to take me all over Beacon Hill and not only narrate the history of the different buildings but also teach me how to take interesting photographs. I strongly recommend this tour. I would gladly recommend this tour to photographers with any camera. To obtain the most from this trip, please have a camera wherein fine tuning can be made to focus, aperture, etc in order to capture all the shadows, and reflections offered. This was amazing! 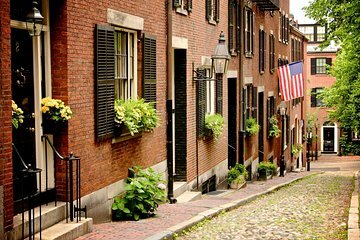 Beacon Hill is so gorgeous and we got the most of it from Saba's insightful tour. Plus we got some of the best photos too! I learned a lot about the neighbourhood and took beautiful photographs. This tour was very good.